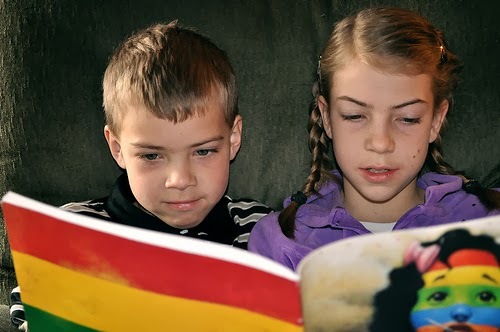 Reading activities are crucial in CLIL methodology. It was pleasant to get to know about it especially, that the idea of borrowing graded readers to my students appeared in Rainbow English many years ago. To be honest, I find reading tasks a waste of time during the lesson. I simply can't imagine the situation when my students spend half of the time reading a part of a novel. They wouldn't be able to concentrate to understand what they'd be reading, the whole thing would be artificial and unproductive. In my opinion, two things are necessary if we want a reading task to be successful and positive - a student has to do it in their own pace and of their own free will. That's why, I keep on buying new copies and distributing them among my students. The rules are simple. A student chooses a book, takes it home together with some after-reading activities that I print beforehand. The book should be taken back in the possibly shortest time for the sake of the other users who might be waiting for it to be available. The condition of the copy must be the best possible so no folding, tearing apart or handwriting on it. Students are not forced to read. They are encouraged. In most cases seeing that their colleagues borrow the readers, the rest joins the project. Each student gets a copy of the after-reading activities that usually are downloadable from the official website. Sometimes there are a few activities already included in the reader but I always ask students to leave them empty. First of all, doing these exercises would ruin the book (constant writing and erasing the answers). Moreover, I have no time for checking the books and rubbing out the students' notes. So we only take into account the extra activities handed out together with the book. If a student wants to be evaluated, gives the hand-out back. Sometimes they don't. I respect this. If the tasks are done in a proper way, proving the fact of reading the book, the student gets a grade. In 99% of cases the highest possible. Parents are encouraged to help, accompany and sustain interest of their children. They are also informed how NOT to act - no forcing, no analysing ("What does this sentence mean EXACTLY?"). I try to explain that the whole thing about reading is to teach to love the activity itself. It isn't aimed at proving that the child doesn't remember the words he or she SHOULD (in parents' opinion). Reading should be a way to learn how to understand the content, how to construct my own sentences. To realise that the content given in a foreign language can be understandable and inspiring. I will start saying that I cannot find any drawback of the Project. The only inconvenience is that I have to buy, bring and collect the readers but to be honest, it's nothing in comparison to the advantages. Firstly, students get rid of their fear of reading in a foreign language. Each time students are anxious but after the first trial they find it inspiring and satisfactory. The fact of being able to read in English means really a lot to them. They prove THEMSELVES that their level is good enough to manage. What is more, they come asking to get "something more demanding". There was a case of a 9-year-old boy who wanted to struggle with the top level, recommended for more advanced learners. He tried, read but didn't do the exercises. We talked about it. Some would call it a failure but for him it was a trigger to practise more! As half of the readers (if not more) are CLIL-like, explaining various content from school subjects the students actually learn. There was a boy who got a high grade at his Science lesson for knowing something about food chains that was not included into the textbook. He came to my lesson grinning and said "Eventually I understood why it is worth learning English!". Yes, the truth is the CLIL gives a chance to revise, expand and research. The last great positive outcome is connected with family life. In some cases the Project enabled parents to spend some time with their children doing something together. If their approach is relevant, they do not put too much pressure but enjoy the fact of learning, this might be a great way to discover the world (of English) hand in hand. One mum already phoned to thank for giving them this chance.